Skrifað á 05 September 2012 . Í Excel gætir þú þurft að breyta eða stafa tölugildi (númer) inn í ensku orð, svo sem að umbreyta 100.25 í ensku orðin "Eitt hundrað dollara og tuttugu og fimm sent". Það er engin virk aðgerð nema að nota VBA kóða til að leysa það í Excel. En með Kutools fyrir Excel'S Stafa út tölur, þú umbreytir tölurnar í ensku orðum eða kínversku orð fljótt. 1. Leggðu áherslu á sviðið sem þú vilt stafa úr tölum í enska stafsetningu (orð eða texti). 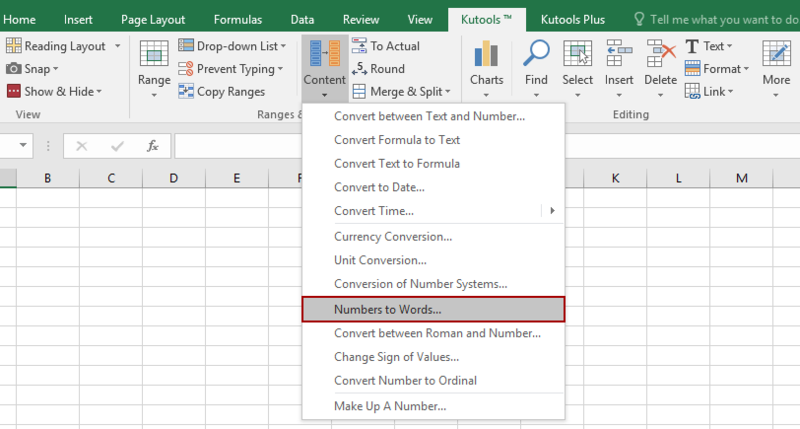 Please make the following corrections to the webpage (read: website) and the Kutools Add-in: numbers twenty-one (21) through ninety-nine (99) are hyphenated when spelled. 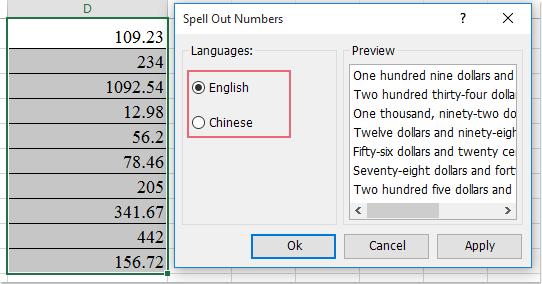 Hey, I am from India and need to Spell Out Numbers in words in Indian Rupee Format. Please help as it shows only in dollars . Make it convenient for individual currencies.